I’ve been whipping up frozen desserts ever since I got my first Cuisinart food processor 22 years ago. Back then, the instructions in the owner’s manual were to put frozen strawberries and a whole bunch of sugar into the processor and trickle in milk or cream as the processor worked. These days, I skip the sugar, add frozen bananas for creaminess and sweetness, and use just a little soymilk to get the right consistency. The result is absolutely delicious, even on an unseasonably cold evening in May. 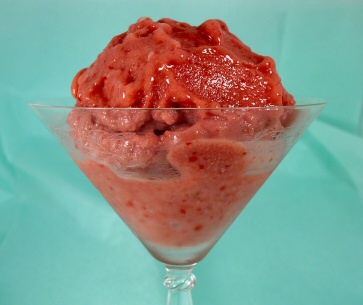 I try to keep several different types of frozen fruit on-hand to make sorbets and smoothies. Frozen peaches and mangoes make wonderful sorbets and can be found in most supermarkets. Another favorite of mine is the “smoothie blend” combination of frozen fruit that includes mango, pineapple, and strawberries. You can also freeze canned pineapple and make an incredible sorbet using it alone or with bananas. It’s so much fun to think of new combinations of this healthy and easy dessert. This makes about 3 large servings. Add an extra frozen banana or cup of fruit for each additional serving. Take the frozen bananas out of the freezer and break them into 3 or 4 pieces. Place them and the strawberries into the food processor and allow them to sit for about 10 minutes, to thaw only slightly. Cover and start the food processor. (Don’t be surprised when the processor bucks like an angry bull when the blade hits that frozen fruit!) With it running, add just a little bit of “milk” (you can also use water or juice here) to help the fruit blend smoothly. I recommend about 1/4 to 1/2 cup liquid for the amount of fruit used here. Stop the processor from time to time and scrape down the sides. Keep processing until the fruit is the smooth consistency of soft-serve ice cream. Add sweetener to taste (I use a little bit of stevia) and process briefly one more time. Serve immediately. Or you can put the whole processor into the freezer until you’re ready to eat and give it another blending right before serving. The sorbet can also be stored in a plastic container for up to a few days and re-processed to soften. I don't have a food processor. Would this work with a blender? Briana, I haven't tried it in a regular blender, but it does work in a Vita-mix. I would start off with the soymilk in the blender and put the fruit on top. Question? Seems to me awhile back when I was trying to do RAW eating, I made pineapple sorbet by just processing in food processor and freezing….also I had a good JUICER at the time and it did it in that wonderfully also. YUMMY! just curious../?? Have you ever tried this recipe in a ice cream maker (such as a Cuisinart)? WOW! Thanks for some great ideas to help beat the 100 degree heat!